I recently took a MegaBus trip. It went very smoothly and I would do it again, though I’d like to get a lower fare next time. 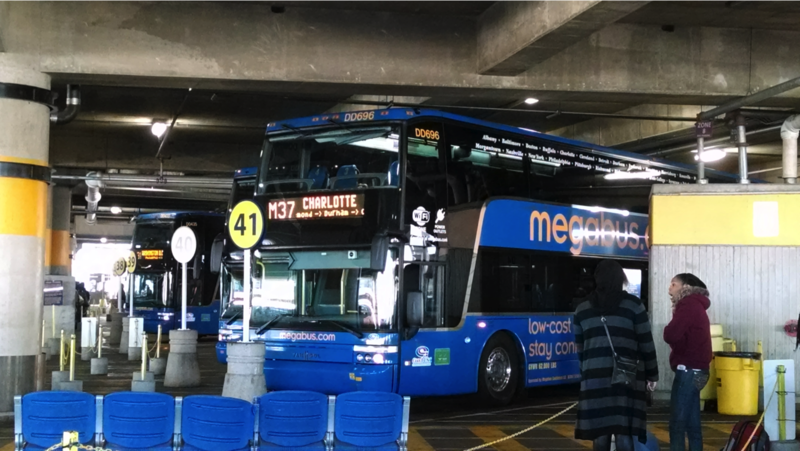 If you aren’t familiar with MegaBus, it is a long-distance bus transit service, serving the US, Canada, and Europe. It advertises that you can buy a fare for as low as $1 and that each bus has outlets and wifi available. The way you get the lowest fare is to be the first to book, and as more seats are sold the price increases. They don’t always operate out of established transportation centers so it’s not necessarily comfortable or (as) safe to wait at the stop. For instance, in Durham the stop is next to but not in the central bus station in the downtown of the city. 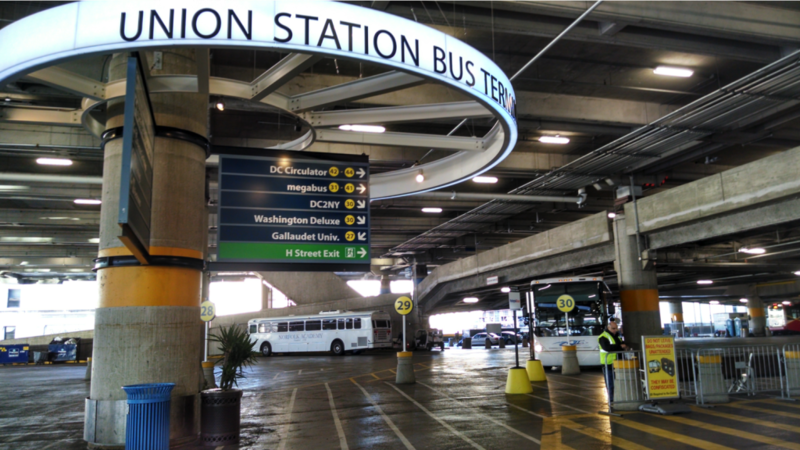 In DC the stop was in a parking garage adjacent to Union Station with other bus companies. My trip was from Durham to Washington, DC; I went there on Thursday, October 9 and came back on Sunday, October 12. My fare was $20 for the first trip and $35 for the second trip, plus a $1.50 booking fee, a $0.50 SMS fee*, and a $1.50 facilities fee. I booked about 1.5 weeks in advance and was surprised that the fare was as high as it was. We have been spending about $70 on gas to drive from Durham to DC, so this was only a bit less. However, it was Columbus Day weekend, so that probably contributed to the price. The buses I rode on were pretty typical charter buses that were double-decker. Both buses had the advertised outlets and wifi, though the wifi was a bit slow for web surfing and I wasn’t able to upload a Word document to a website. They were air conditioned and clean. There was a bathroom on board, though I did not use it. My luggage was stored on the lower level of the bus and I kept my laptop bag with me in my seat. Each seat had a seatbelt, though no one seemed to use them. The seats were even smaller than typical airline seats, both in width and legroom. I am a pretty small person and I felt cramped trying to avoid touching the people sitting next to me. On one leg of my trip, the person in front of me reclined her seat, and in that position I was not able to open my laptop to 90 degrees even with it pulled as far toward me as possible. For this reason, if you want a comfortable trip, I would only recommend MegaBus for people on the shorter side who are not morbidly obese. On my trips, the only stop between Durham and DC was in Richmond, which was very quick. The trips were supposed to last about 5 hours and 15 minutes; when Kyle and I drive, it takes us less than 4 hours because our final destination is in the Virginia suburbs and we drive late in the evening. My instructions were to show up at least 15 minutes in advance. At each of my stops, there was clear signage for where to line up, and the passengers boarded in an orderly fashion. I arrived about 30 minutes in advance for each trip and there was already a line formed. For my trip originating in Durham, we began boarding at the departure time and pulled away about 15 minutes later. However, the bus then drove to a local motel to change out the driver, so we didn’t leave Durham until about 40 minutes after the departure time. We were then late getting into DC, entering the city at the time we were supposed to arrive at Union Station. I started following our path using Google maps so I could coordinate with my ride, and for whatever reason we were hovering around 10 minutes away from our destination for about 15 minutes. Ultimately, we arrived about 25 minutes after our scheduled time. For my trip originating in DC, we started boarding about 5 minutes before the departure time. Everything went very smoothly and we arrived about 25 minutes early. However, I noticed that when we got into Durham, the driver took a very indirect route to get to the stop (staying on freeways far longer than necessary) that added about 10 minutes to the trip. Perhaps there is some policy about what types of streets they can drive on or turns they can make, but it might explain the delay getting to Union Station as well. I was very happy with my trips because I was able to work (er, play) on my laptop/iPad throughout the ride. If I were driving, I obviously would not have been able to be productive at all, and even when Kyle is driving us I generally want to interact with him so I don’t work much if at all. It was noticeably easier to work on the bus than in a plane because there were no restrictions on what devices I could use when. I should note that Kyle has taken one MegaBus trip and it was not as good as mine because the outlet available froze his phone while it was plugged in. At that time, the DC stop was not in Union Station but a few blocks away. He also arrived back in Durham at about 3 AM quite a bit early, which was kind of sketchy as I wasn’t there to pick him up right away. In conclusion, I would take a MegaBus trip again, especially for trips of this few-hour length. I would even consider paying more than I would spend in gas if I were traveling by myself just so I can work, as long as I didn’t need a car at my destination. However, the next time I make a MegaBus trip I will buy the tickets earlier to try to grab a lower fare. * When I clicked “yes” to get my itinerary by SMS, I didn’t realize I was being charged a fee. It basically just texted my confirmation number, which you need to show the driver before you board. I didn’t end up using this because I showed the driver my (free) email confirmation on my smartphone. Have you ever used MegaBus or a similar service? Would you pay more or less for a ride on shared transport than you would on gas to drive yourself? 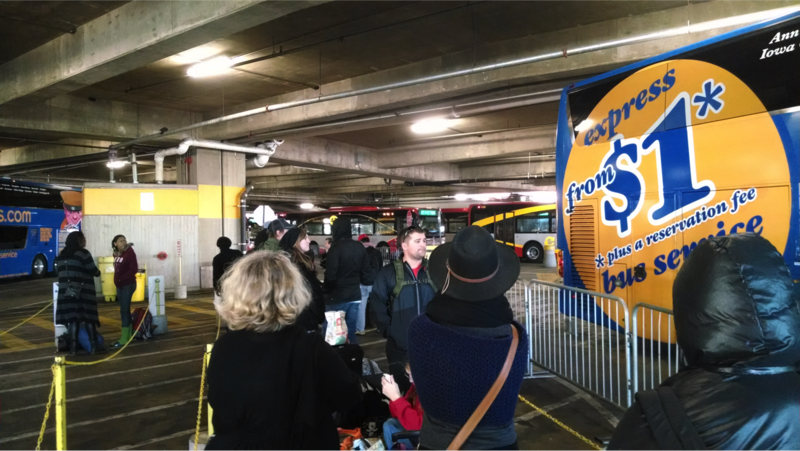 25 Responses to "My First Trip on MegaBus"
Never been on a megabus. I never thought it had a bathroom. I wish you could have tried it to if it’s okey or not. I’d love to try it when I go Washington. It looks very cozy. Thanks Emily! I bet the bathroom was okay, for what it is. The rest of the bus was very clean. Used Megabus for the first time on a trip to Las Vegas. Emily, I had a good experience. Just paid $29 round trip so it was not a bad way to start. I tried the bathroom. Haha! Generally, it’s clean and nice, staff were friendly, and the most important is it’s perfectly on time. I’m glad your trip worked out well! And Vegas seems like a good destination to try it out for. I’ve taken MegaBus and Bolt Bus several times and had good experiences for the price. I don’t think I’ve ever paid nearly as high as you did, it’s usually been in the $10-15 range, but I’m surprised you even got seats that close to a holiday weekend. My main issue is that most times, the wireless hasn’t worked for most of the trip, so that’s pretty annoying. But $10-15 is way cheaper than gas and tolls going even one way where I’ve traveled, and also much cheaper than the more established bus lines. Yeah, if I had realized it was a holiday weekend I would have been more deliberate about buying earlier. Now that you mention it, I am glad I was able to get a seat! But I was traveling probably one day off from the peak travel days for that holiday. $10-15 one way sounds like a very reasonable fare, especially when you factor in tolls! I always forget about tolls since I don’t run into them in the South. 🙂 I’ve heard that about the wireless before, so I was prepared with offline work, but I was pleased to find it did function when I needed it. I kept it off most of the time, though, just because I didn’t want to be web-surfing. I’ve taken Megabus once before, and it left an hour late. Good to hear of a better experience! You shouldn’t be comparing the gas cost of driving yourself to the Megabus ticket. The IRS estimates that when you take into account the maintenance that is eventually required for driving the average car on the road today, along with the gas costs, is 56 cents a mile. Now granted, I believe you guys have a sedan? So your mileage is better than the average car. And perhaps your car is more reliable than the average car. If we were to guess that after considering these two factors, the cost of driving is 40 cents a mile, that’s still a cost of $114 each way! Of course, getting a true cost per mile estimate is quite difficult, but you can always establish reasonable lower and upper bounds with just gas costs and the IRS estimate (provided you have a car that is more efficient than the average car on the road today), respectively. I was noting the times that we started boarding, pulled out, actually left the city, etc. because I really didn’t know what the schedule was supposed to be. I guess it was late to be leaving the city 40 minutes after the scheduled time because we ended up arriving late, but I wasn’t sure at the start of the trip. The driving time is really much less than what they scheduled, as evidenced by arriving early when we actually left on time. Did your driver make up any time after leaving an hour late? It’s kind of weird that I’m judging a bus harshly for leaving behind schedule when planes do it all the time! Thanks for the correction about calculating the true cost to the vehicle rather than just gas. I never think about that because I haven’t gotten mileage reimbursed for anything in the past. In addition, there’s the environmental factor – I’d much rather take public transport than drive all alone. I don’t quite remember but I’m pretty sure we didn’t make up for any time. In my experience, while I have had planes leave somewhat later than scheduled, only twice have I arrived more than about 5 minutes late! Yea it’s easy to forget the true cost of driving. I wish the IRS would publish how they arrived at 56 cents per mile – how much of that is gas, how much of maintenance, etc. I couldn’t find such details though. I looked it up once when I started getting mileage a few years ago, but can’t find the link now. If I remember correctly, the cost per mile calculations included all costs to operate the vehicle, including insurance and potentially registration fees. While I understand why those costs factor in the reimbursements, I usally estimate a little lower than the reimbursement rate when comparing for a personal trip since I would pay insurance and registration whether I was driving the car or had left it in my driveway. Unfortunately I can’t remember the exact breakdown in costs though! Of course its a third party estimate, not a breakdown of how the IRS arrived at 56 cents per mile. As you said, fixed costs are included in this estimate. Apparently about 19% is fixed costs. The depreciation is the biggest factor, at 45%. Unfortunately, depreciation is something that is really hard to model, not just because it’s hard to guess what the fair market value of a used car is or will be, but because its a nonlinear function – depreciation is quite rapid for the few years/thousands of miles, but slows down over time. I haven’t been on a MegaBus, but my dad and a couple of his friends did a round trip Detroit – Chicago trip several years back and they were very satisfied. I think that the only complaint was that one or two of the stops along the way was longer than on the itinerary. Money Beagle recently posted..Farewell, Newspaper Subscription! I can see how that might happen, which is why I was so pleased that our Richmond stop felt like it took almost no time whatsoever. Thanks for sharing your dad’s experience! I’ve never been on a Megabus, but I’ve considered to go from PA to NYC. The bus fare is about the same as gas, but you don’t have to pay for parking that way. Per my comment above, the true cost of driving should incorporate the eventual maintenance costs incurred by driving. The IRS estimates that for the average car on the road today, it costs 56 cents per mile. Of course, if you have a more gasoline efficient car, this drops. For a car that averages 40 mpg, and a gas cost of $3.50 per gallon, that’s only 8.75 cents a mile. Gasoline is not the largest cost of driving. And of course, as Emily mentioned there’s the environmental cost of you driving just yourself or a couple others, versus taking a bus that is full of people. That sounds like it would be a good, quick trip also – and for sure cheaper after accounting for all the costs. I always see these buses on the highways and wonder how far you can get for $1. I should probably actually look into this a little more… Off to the Megabus site. Interesting idea. I’ve seen the increasing price technique used for cheap flights and even cinema tickets, but not for bus travel. I’m not sure if it’s monotonically increasing, but that’s the impression I got. I’m fairly sure only the first or first set of purchases get that $1 fare. Interesting! I’d heard about MegaBus, but didn’t know anyone who had personally used the service. I’ll definitely have to check it out! I don’t often travel by myself by ground, but next time I do I’ll definitely consider MegaBus.